Old Harbor, Alaska, is not any easy place to reach. For me, it required a flight from California to Anchorage, a connection to Kodiak Island, and finally a 30-minute hop to our final destination. By the time brothers Marc and Jeff Bauman and I boarded the small, twin-engine plane in Kodiak bound for Old Harbor, all we wanted to do was get there. However, the last leg of the journey was the most interesting. The flight took us over fjords flanked by spruce and hemlock forests, steep cliffs that rose from the water's edge and spectacular, snow-covered peaks. As we landed in Old Harbor, we were ready for five days on Kodiak Island where puddle ducks, sea ducks and maybe even a little fishing was on the agenda. Once we were on the ground, it didn't take long for our guide and outfitter, Jeff Peterson, to greet us. After introductions, we put our gear in Peterson's pickup and drove five minutes to the Mountain View Guest House. After a dinner of fresh Alaska salmon and all of the trimmings, we settled in for a good night of rest. The next morning, the tides were perfect for sea duck hunting. We headed for a point on the far side of Sitkalidak Island, where harlequins and scoters pass as the tide drops. We boarded Peterson's 24-foot boat before first light, and 45 minutes later, dropped anchor in a deep fjord on the south side of the island. Peterson ferried us to the beach in the skiff he had towed behind the big boat. Once on shore, the skiff was used to set out the decoys, and later, to retrieve birds. The point had little cover other than rocks and a few pieces of driftwood. However, I knew based on previous sea duck hunting experiences in Alaska, it doesn't take much of a blind to deceive sea ducks. Nevertheless, we used driftwood and camouflage netting to construct a makeshift blind on the point. The decoys, painted to resemble scoters, were set in two lines 25 yards off of the point. The first flock of harlequins came from the windward side of the island. The lead drake was only a few feet above the water when Marc Bauman raised his shotgun. With a single blast, he pulled the rug out from under the decoying bird. My shots where less focused, so it took me two rounds to anchor a drake that tried to escape our ambush. Peterson was waiting offshore in the skiff. At our shots, he came quickly to retrieve the birds. Because sea ducks are incredible divers and can stay submerged for long periods, our guide made sure all birds were retrieved immediately. Besides, too many hungry eagles were lurking nearby to leave a bird floating on the surface for very long. I motioned Peterson to bring the harlequins to us for a closer look. It was Marc Bauman's first harlequin, so we took a few minutes to admire the prize. Frank Bellrose, in Ducks, Geese and Swans of North America, provides a fitting description of this handsome bird: "The harlequin male is the most bizarrely colored waterfowl, as though a whimsical artist had decorated a deep blue duck with random but precise white-painted markings of various shapes and sizes. The basic body color is a glossy slate blue, enlivened by a white crescent and dash-like stripes and spots on the head, neck and scapulars. The sides and flanks are chestnut." It was early November, and the birds were in perfect plumage and suitable for mounting. Our admiration society was rudely interrupted when Jeff Bauman spotted a flock of black scoters heading our way. As they passed 100 yards off of the point, they spotted the decoys and made a hard turn to take a closer look. As the ducks approached, the Bauman brothers hunkered in the blind. When the scoters were 25 yards out and over the decoys with feet down and wings cupped, Jeff Bauman called, "Take 'em!" Two shots rang out, and two drakes hit the water. Marc Bauman managed a second shot at the survivors, and dropped another scoter. As morning turned into midday, the sun rose into the gray sky and the tide continued to fall. Dozens of flocks both large and small passed off the point and out of range, but enough of them spotted our impostors to provide good action. Between the singles, pairs and small flocks of harlequins and scoters, the occasional oldsquaw would swing inside our bay, but never truly commit to the decoys. We managed a couple of long shots, but could not put an oldsquaw in the bag. We ended up with a nice mix of harlequins and scoters. By early afternoon, the tide had dropped and the action slowed. We still had a few hours before sunset, so we decided to try fishing for halibut on the way back. After a 30-minute run, Peterson turned on the sonar looking for a high spot in the channel between Sitkalidak Island and the mainland. He set up a drift and we dropped circle hooks baited with squid. Before long, I had a bite. By the time we quit, we had four 40- to 50-pound halibut in the fish box. We started the day with good sea duck hunting and ended it with top-notch halibut fishing, making our first day a quality cast-and-blast experience. We were spoiled -- our first day would be a tough act to follow. Officer in Old Harbor and eventually went back to what he enjoys most: hunting and fishing. Peterson has been guiding full time for nearly 20 years. He offers combination fishing and hunting trips, such as duck hunting and halibut fishing, as well as ocean salmon fishing, stream salmon fishing and deer hunting. The population of Old Harbor is about 300, with its roots both in Native and Russian cultures. Two hundred years ago, a Russian sailing ship came to Old Harbor in search of fur and whales and established the first Russian colony in the New World. A historic Russian Orthodox Church, with its blue towers and white crosses, stands at the edge of the village. Today, Alutiiq residents live alongside Russian descendants and a few transplants from the lower 48. The economy revolves around commercial fishing and tourism. Old Harbor is not connected by road to the town of Kodiak, but is reached by daily flights from Kodiak. Kodak Island is nearly 100 miles long and up to 50 miles wide, covering 3,600 square miles. Most of its 15,000 people reside in the seaside community of Kodiak, where commercial fishing, tourism and the largest Coast Guard station in the United States are the basis for its economy. The island is world famous for its unique population of Kodiak brown bears, a huge coastal species of grizzly. Estimates put the population of brown bears at about 2,000 animals. The bears are huge, standing up to 10 feet tall and weighing more than 1,500 pounds. Much of the island is under the management of the Kodiak National Wildlife Refuge, with other lands controlled by native corporations and private individuals. The next day, we targeted puddle ducks where a river met the sea to form a small estuary. The sun's first rays tinted the horizon as we powered to our destination. As we pulled into the estuary, at least 100 ducks flushed from a back bay. Before I could open my mouth, Peterson said, "They'll be back!" We loaded our gear in the skiff and motored to a pool adjacent to a grassy bank with scattered willows. We put out a dozen mallard decoys, and then did our best to find a hiding place in the sedges. The first ducks to appear were little more than a blemish in the clear Alaskan sky. Mallards. As they winged closer, we could see it was a flock of a dozen birds. However, they passed well out of range, headed for some distant marsh. Then, out of the corner of my eye, I spotted a single mallard diving straight for the decoys. When the bird was 20 yards away, Jeff Bauman fired and missed. I backed him up and dumped the bird in the decoys. Next, a flock of a dozen green-winged teal was on us almost before we knew it. I raised my over/under, swung past a small grey blur and pulled the trigger. The teal cartwheeled across the surface, coming to rest only 10 yards from our hiding place. Both Baumans emptied their shotguns, adding two more teal to the bag in the process. Before we could retrieve the birds, we spotted another pair of greenwings. Seconds later, Jeff Bauman pointed out yet a larger group in the distance. We decided to let the pair come all the way and land if necessary in order to have a shot at the larger flock. Our plan worked. The first pair literally touched down about the time the flock was 30 yards up and over the decoys. "Now!" Jeff Bauman swung right, and his brother swung left. Marc Bauman connected, and his bird dropped in the decoys. Jeff Bauman's first shot found its mark, followed by the telltale splash of a bird hitting the water, then a second splash. The balance of the morning held steady action. Teal dominated the bag, with mallards and bufflehead sprinkled among the kill. The final day, the conditions were ideal to hunt from a layout boat. The wind was strong enough to keep the birds moving, but not so strong to make the use of a layout boat dangerous. We motored about 30 minutes from the harbor and deployed the layout boat just off of a rocky island. Peterson anchored the single-man layout and set the decoys at the bottom of the boat so the birds would fly up the string of decoys. Marc Bauman took the first shift as gunner. About 10 minutes into the hunt, a dozen black scoters rounded the point and headed for the decoys. Marc Bauman sat up and fired when the birds passed over the decoys. It was his first time hunting from a layout boat. By the time Marc Bauman sat up, he only fired once and missed. The next birds in were a trio of harlequins. Marc Bauman selected a drake and smacked it hard just outside of the decoys. During the course of the morning, all three of us took turns in the layout. We ended up with a mixed bag of harlequins, common goldeneyes, buffleheads, surf scoters and black scoters. In September, puddle ducks leave their northern breeding grounds in Alaska and Canada and migrate to Kodiak Island, where they pause to feed and rest on their southward journey. By mid-October, these birds are joined by diving and sea ducks that have left the far north to seek a winter home with milder weather and abundant food. Most of the puddle ducks continue south down the Pacific Flyway and end up in Washington, Oregon, California and Mexico. Because Kodiak Island has numerous ice-free bays, lagoons, tidal flats and a rocky coastline rich in marine life, more than 100,000 diving and sea ducks winter there. For species such as black scoter, Barrow's goldeneye, harlequin duck and oldsquaw, Kodiak is an important wintering area. For other species, including king and Pacific eiders, it is their most southerly wintering area. The best puddle duck hunting is from opening day until about mid-November. While good populations of diving and sea ducks are present by mid-October, serious hunting for sea ducks does not occur until December and January, when the plumage is best. Most years, the eiders don't show up until December when pack ice forms in the Bering Sea and pushes the birds south. 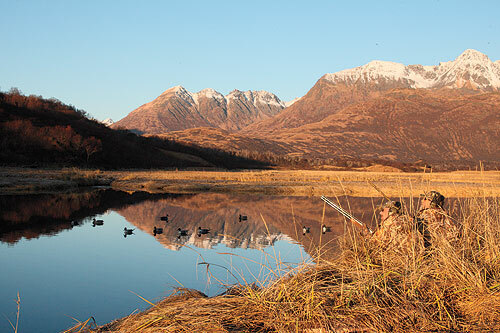 Kodiak Island is a magical place where uncrowded, quality waterfowling blends with spectacular scenery. A trip to Kodiak for puddle and sea ducks is an adventure that will last in your memory forever. Duck season on Kodiak Island runs early October to late January. Puddle/diving duck limits are seven per day, with 21 in possession. Sea ducks limits are 10 per day, 20 in possession for residents, and seven per day, 20 per season for nonresidents. The nonresident sea duck possession limit of 20 for the season includes no more than four common eiders, king eiders, black scoters, white-wing scoters, surf scoters, oldsquaws or harlequins. A resident hunting license is $25, and a season nonresident small-game license is a bargain at $20. State ($5) and Federal duck stamps ($15) are required. Jeff Peterson of Kodiak Combos offers duck hunting throughout the season and specializes in collector's trips for full-plumage scoters (all three), oldsquaws, harlequins, Barrow's goldeneyes and king eiders in December and January. Visit www.kodiakcombos.com. For general information, contact Kodiak Island Convention & Visitors Bureau, (800) 789-4782; www.kodiak.org/explore-kodiak. For license information, contact Alaska Department of Fish and Game, (907) 486-1880; www.adfg.state.ak.us. Alaska Airlines, (800) 426-0333 and Era Aviation, (800) 866-8394 serve Kodiak from Anchorage.